I like to eat out, a lot. 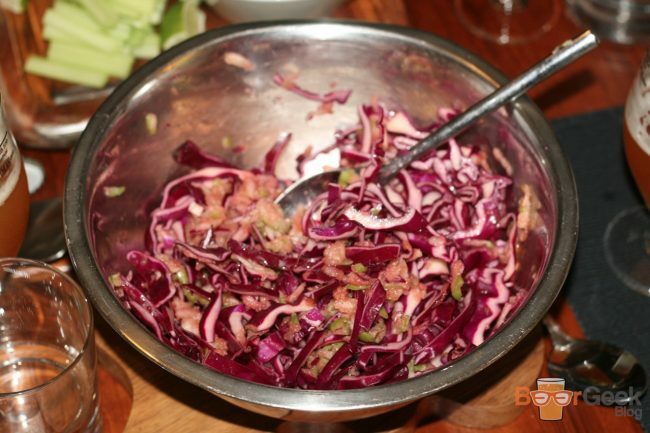 Usually, in restaurants but a few years ago I started attending supper clubs too. 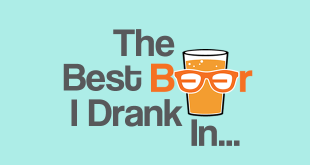 I love them because most are BYOB (bring your own booze). 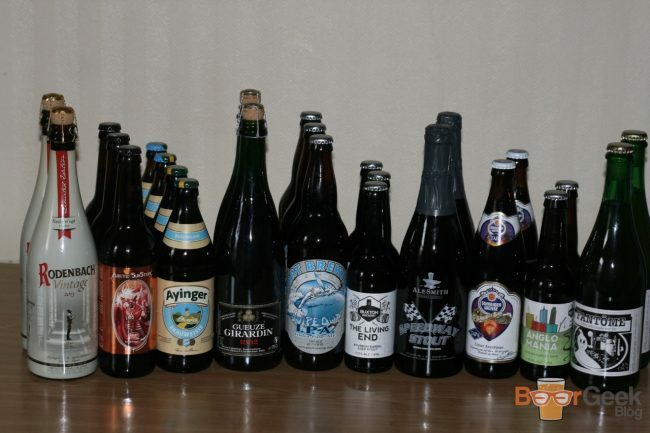 People generally go with a bottle of wine or two but I like to take a variety of beers to pair with each course. 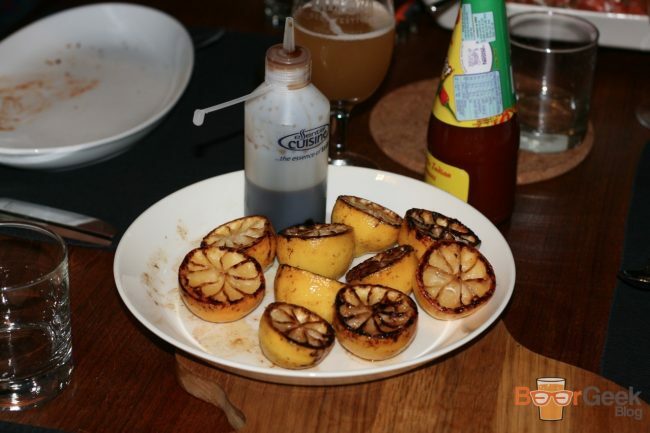 Some of the best supper clubs in Manchester are undoubtedly the Drunken Butcher’s. Okay, I may be slightly biassed because we’re friends. But then again, we’re only friends because I liked his food so much I couldn’t stop going to his nights. At one particularly boozy Drunken Butcher supper club in 2014, I decided I wanted to host my own event. With a bespoke menu and guests drinking beers chosen by me. I collaborated with the Drunken Butcher – aka Iain Devine – on the menu and spent weeks obsessing over the pairings. Eventually settling on a 7-course tasting menu, including a curated cheeseboard at the end. 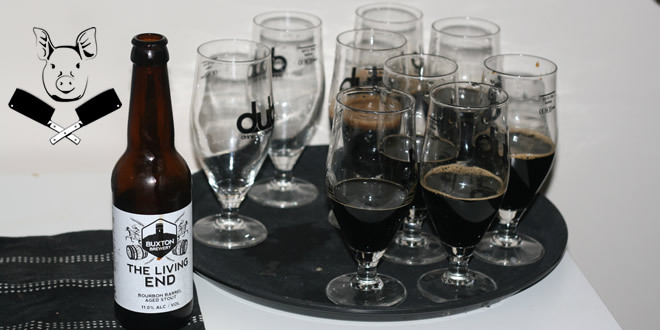 With a total of 11 paired beers, one for each course, four with the cheeseboard and an apéritif. It was a long time coming – like 18 months long! 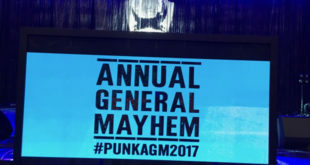 – but finally happened earlier this year. We started with an ‘Apéritif’. I wanted a beer that could replicate the job of Champagne. 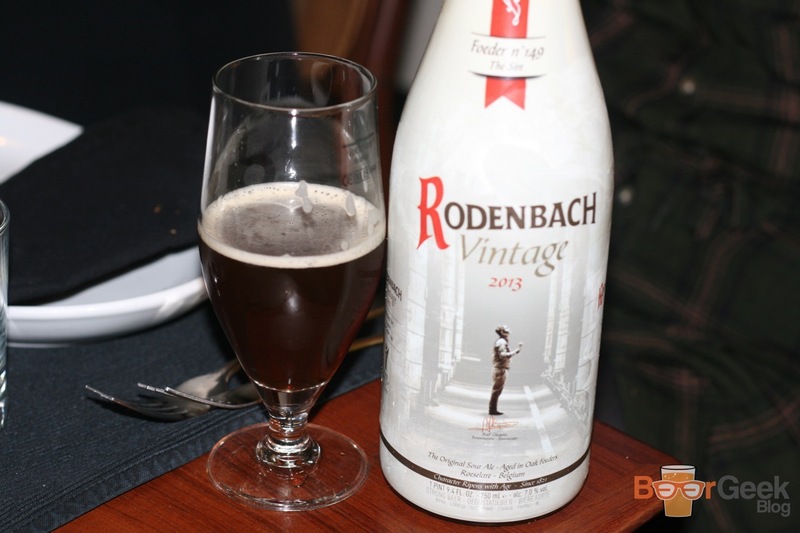 After lots of testing I settled on ‘Rodenbach Vintage 2013’. A limited version of the classic Belgian sour that’s aged in wood barrels for 2 years. It’s fairly complex but very refreshing. And a good way to reset the palate thanks to the champagne like carbonation. We got off to a great start food wise as well. 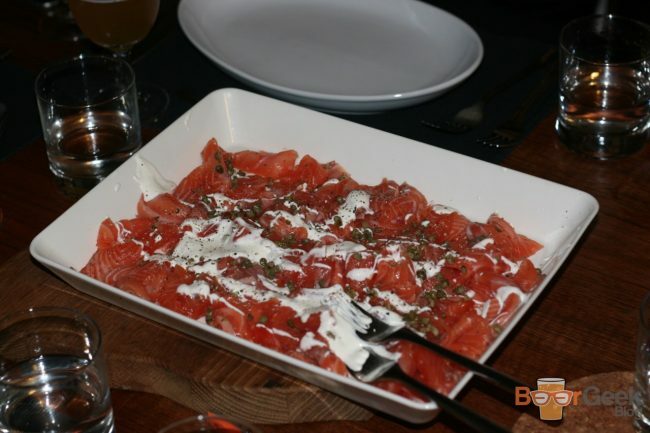 The first course saw gorgeous thin slices of luxurious salmon cured in gin. 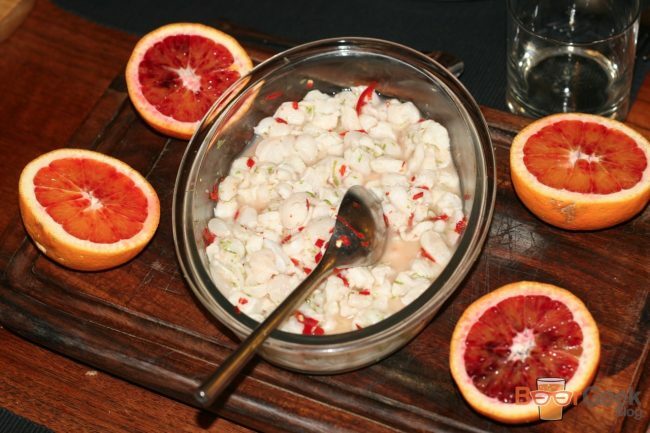 And, perhaps even better, chilli cured cod cheeks. 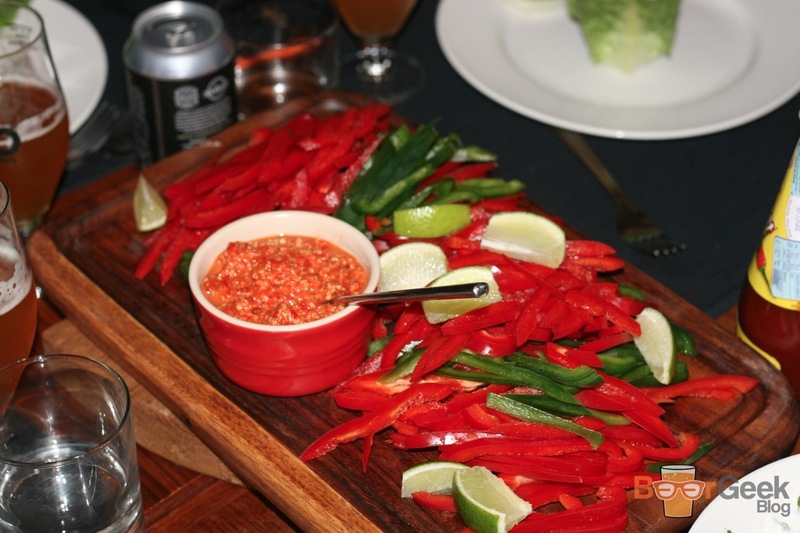 Meltingly tender having been just lightly cured in zingy lime with a gentle chilli kick. 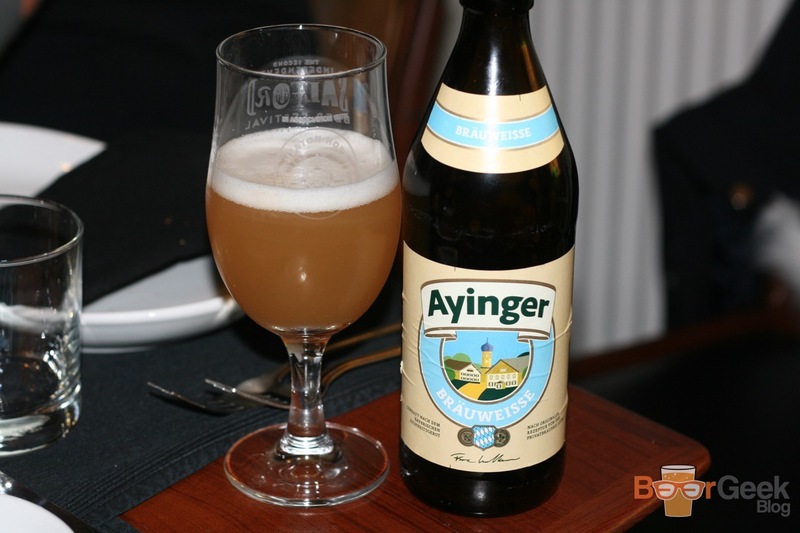 The first pairing was ‘Bräu-Weisse’, a lovely wheat beer from German brewery Ayinger. Although it looks like a traditional hefeweizen with its hazy glow, it was chosen because it’s much lighter than most. With a subtle lemon and vanilla aroma and fruity, spicy and citrus notes it was a perfect match for the delicate seafood. The next course was the polar opposite; deep fried, rich and salty. ‘Fried Onion Soup’ was a revelation when I first had it at Iain’s in 2014. You might be wondering ‘how do you deep fry soup?’ Well, you fill dumplings with it of course! Crisp wonton style dumplings that fill your mouth with hot, rich onion soup as you bite them. 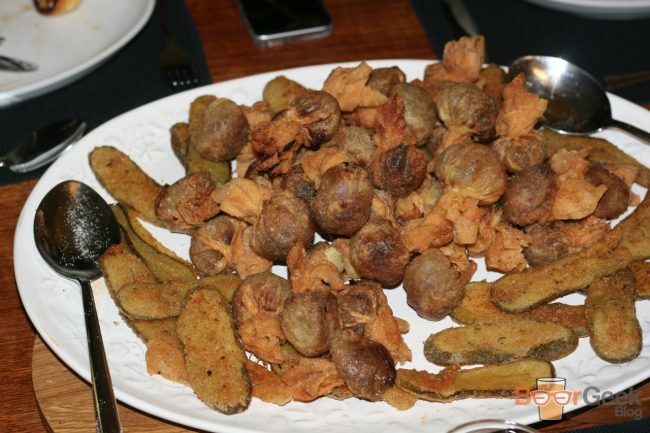 And ‘Fried Pickles’ are a particular favourite of mine too. I’ve been known to book into a certain restaurant in Manchester just to eat them. Loads of beers pair well with salty, fried food. I went for ‘Arctic Sunstone’. 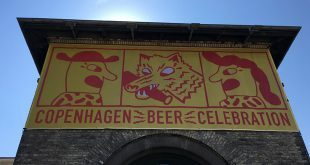 A collaboration between Danish brewery Amager and legendary American brewers 3 Floyds. An American style pale with bags of hops and a refreshingly bitter finish to cut through the fat of the fried food. Whilst most of the evenings menu was essentially my personal Drunken Butcher ‘Greatest Hits’, there was one dish that I hadn’t had before. ‘Lapin a la Geuzue’ is a classic Belgian dish with rabbit braised in gueuze, a traditional Belgian sour beer. The day before the supper club I delivered four large bottles of ‘Girardin – White Label’ for the two whole rabbits to be slow cooked in. The dish turned out even better than I expected. Particularly as Iain hadn’t heard of it and hadn’t ever tasted a geuze before. 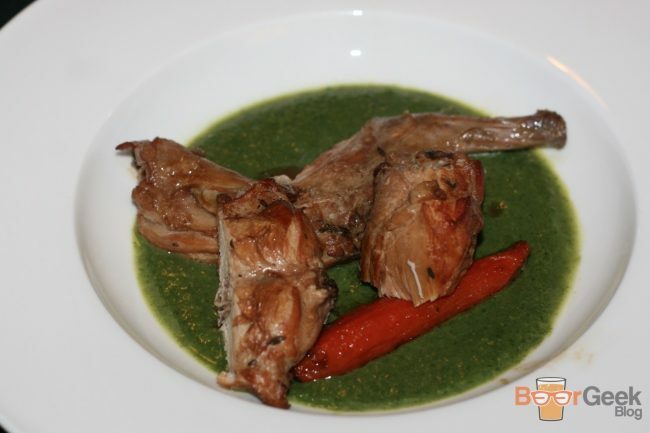 Juicy pieces of tender, sweet rabbit meat with a watercress and broccoli puree and a roasted carrot. 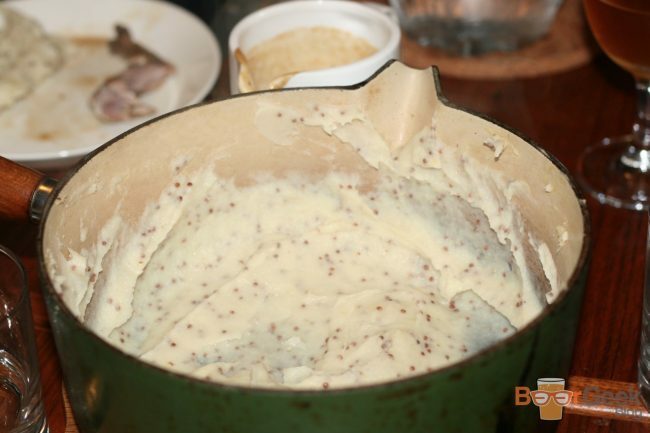 Served with super smooth and buttery mash with wholegrain mustard running through it, a brilliant flavour combination with rabbit. But the highlight was the incredible sauce. It was immense, like no flavour I’ve ever encountered before. Incredibly rich yet somehow light, with none of the sourness from the beer but a distinctive tang and tons of gamey flavour from the rabbit. There was clearly only one style of beer to serve this with. 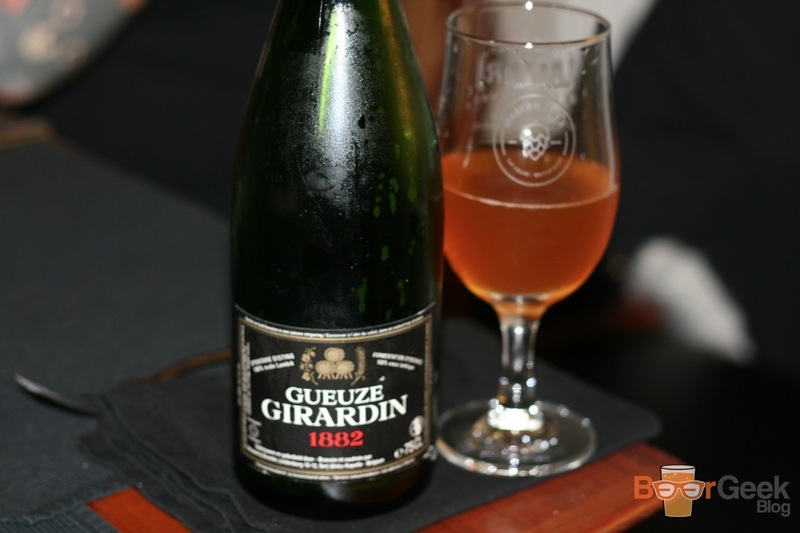 It had to be a gueuze. 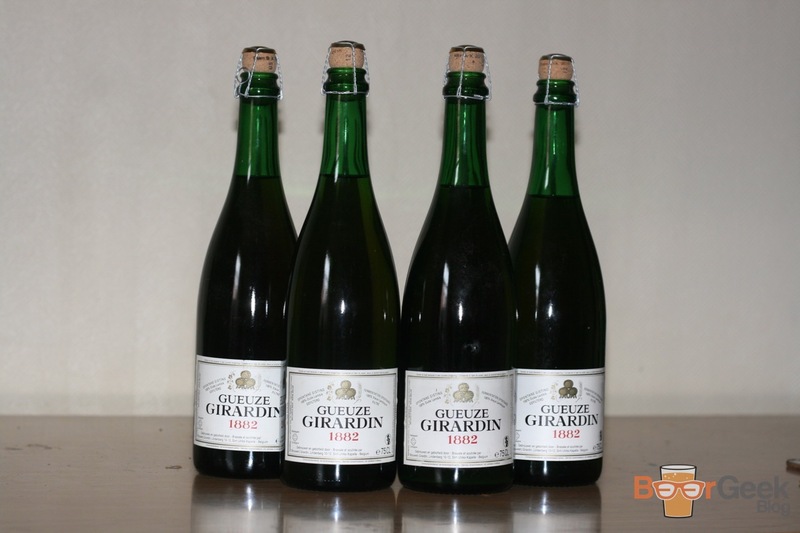 I went for ‘Girardin – Black Label’. 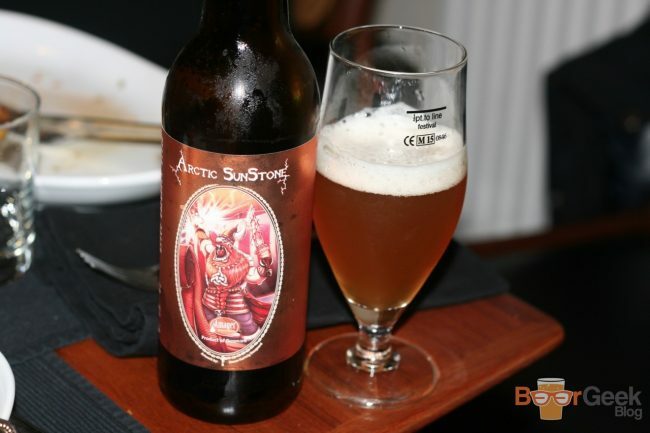 The superior, unfiltered version of the beer that was used for cooking. It’s complex; sour, acidic, funky and woody with a crisp dry finish. The main course was another of my Drunken Butcher favourites, ‘Pork Bossam’. A traditional Korean dish slow cooked in beer (last time he used Japanese lager Asahi but I forgot to ask this time) and various spices. It’s then chilled in the cooking liquid before being roasted. 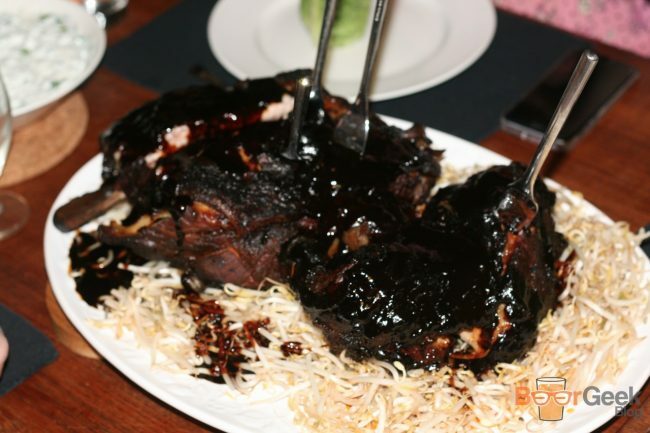 The result is succulent, melt in your mouth pork with a sticky, chewy outer bark that’s absolutely packed with flavour. The large joint of meat arrived on a bed of beansprouts with a number of other accompaniments. 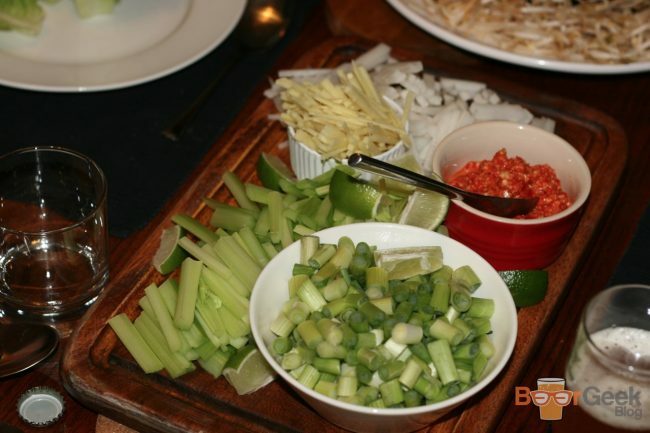 Including chopped peppers, cucumber, spring onion, ginger, chilli and various hot sauces. Whole baby gem lettuces were also served. The leaves to be used as wraps and filled with the soft meat and crunchy veg. 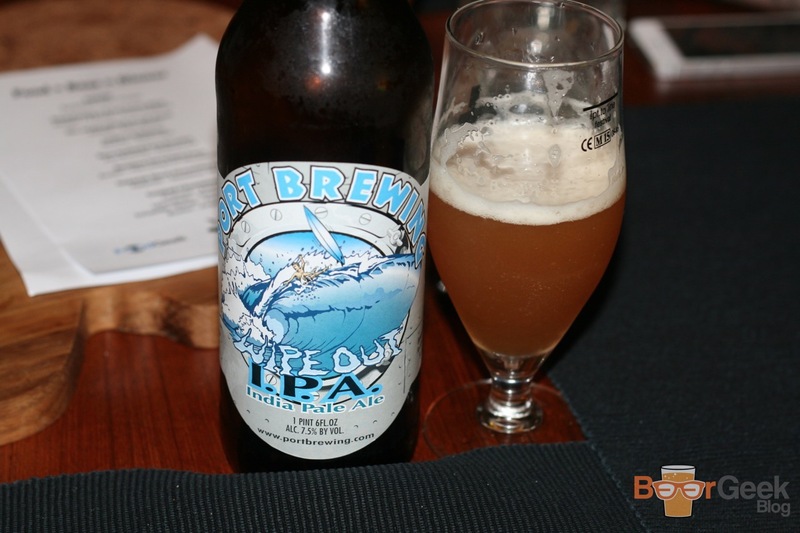 I paired the main course with Port Brewing’s ‘Wipeout IPA’, a massively hoppy West Coast IPA. Its big citrus and pine flavours matched the vegetables and sauces perfectly. While the high bitterness cut through the fatty meat. I think I gave Iain an easy ride with this menu as I brought two of the three dessert courses with me. Starting with my famous imperial stout chocolate cake. I’ve made this cake numerous times with several different beers. I like it best with Buxton’s ‘Rain Shadow’. It’s hard to write about my own food objectively but it really is a fantastic cake. 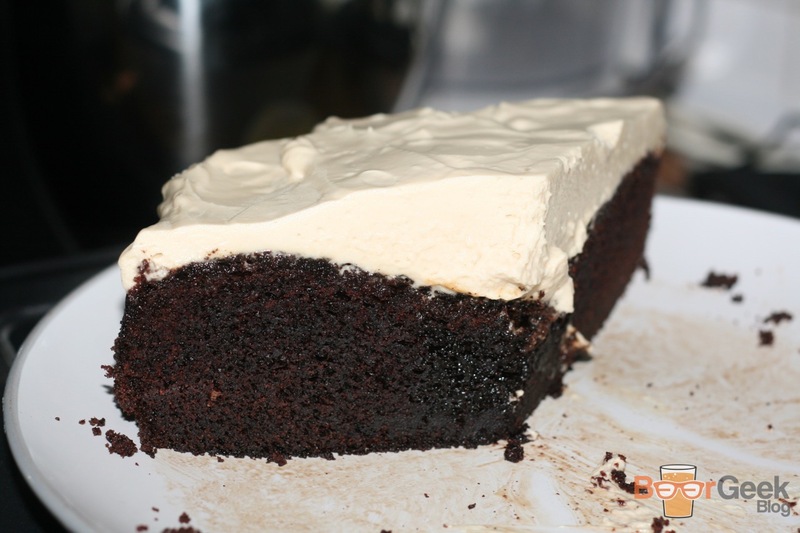 Super moist, rich and chocolatey. With a gorgeous cream cheese frosting that also has Rain Shadow running through it. 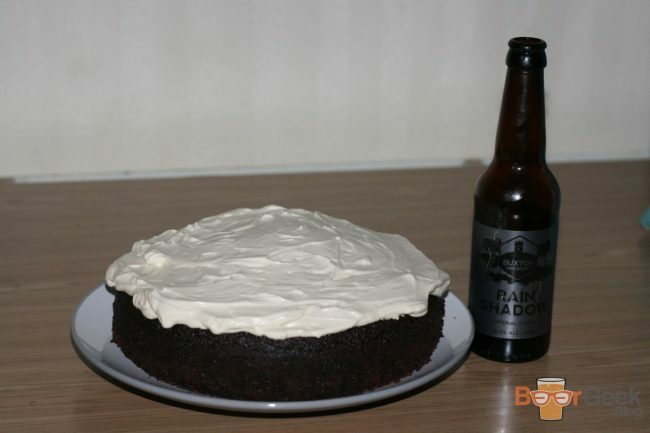 I could’ve served the cake with Rain Shadow, but that would be cheating. And whilst it’s a great beer it’s not quite up there with the very best stouts. Instead I went straight to the top. 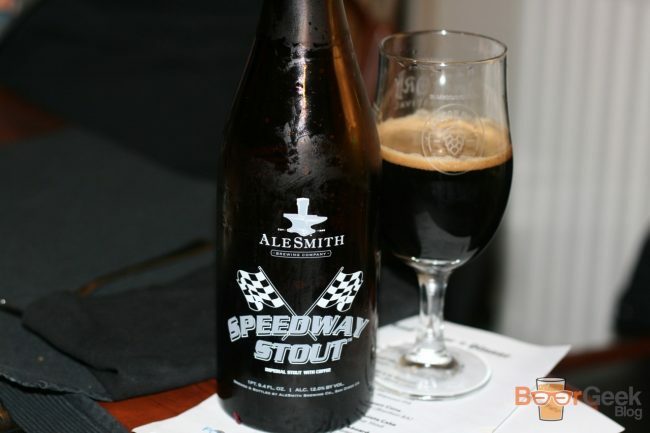 AleSmith’s ‘Speedway Stout’ is probably my favourite imperial stout in the world. 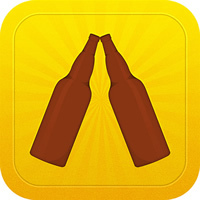 Its countless awards along with a 100/100 RateBeer score suggests that the world agrees. Brewed with local Californian coffee. The flavours are full on roasty and toasty, predominantly dark chocolate and espresso. 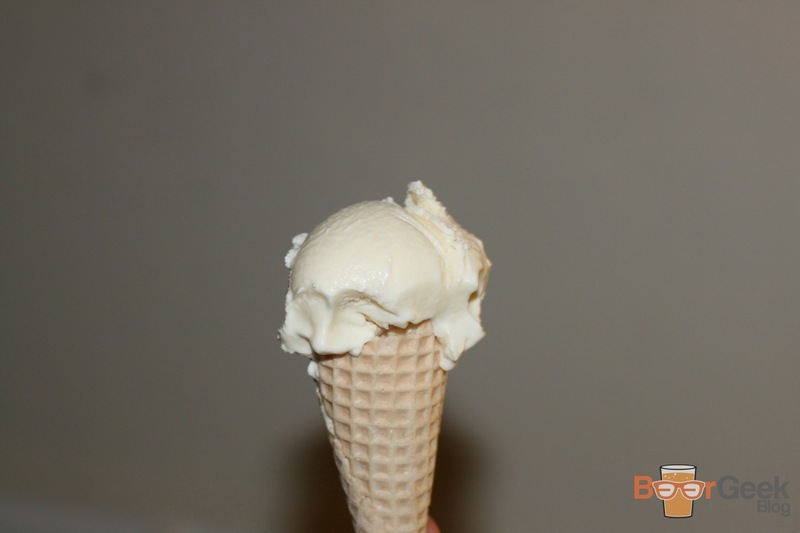 Iain is renowned for his boozy desserts, particularly his ‘Bourbon Ice Cream’. It’s yet another Drunken Butcher classic. I’m not even a huge bourbon fan but this ice cream blows my mind every time. 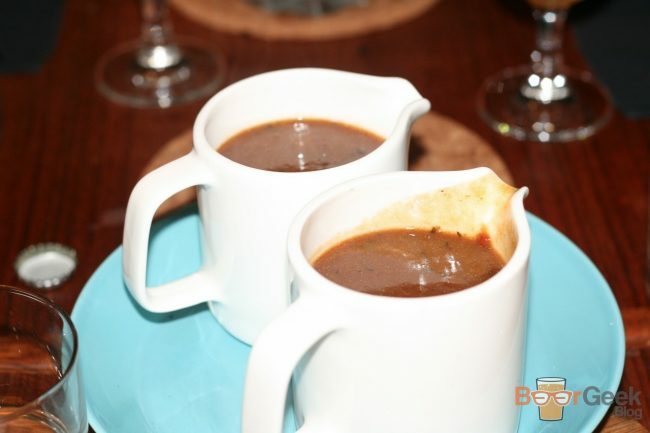 It’s rich and creamy with a massive boozy warmth from the bourbon. 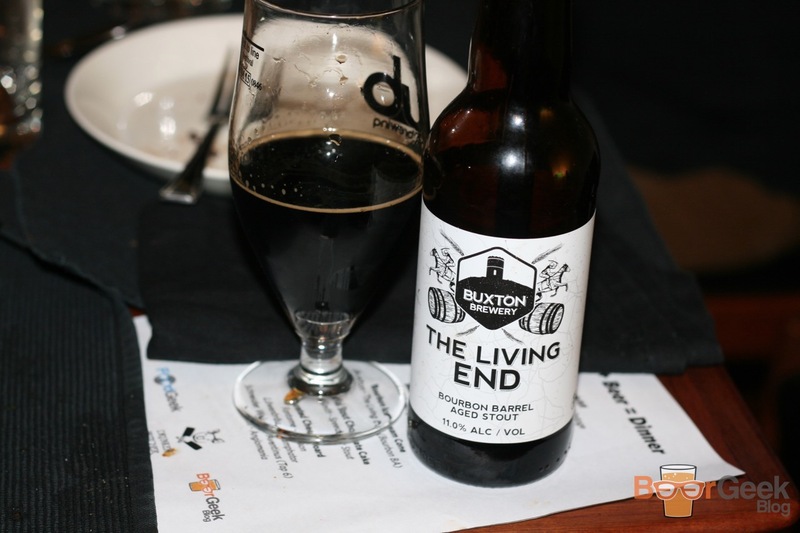 I paired the ice cream with another quality imperial stout from Buxton Brewery, ‘The Living End’. This one is an 11% beast that’s aged in bourbon barrels. Imperial stout and ice cream is already a match made in heaven. But with the added flavour and booziness from the barrel ageing this was a stunning combination. I’m passionate about paring beer with food and none more so than cheese. We ended the night with a curated cheeseboard. 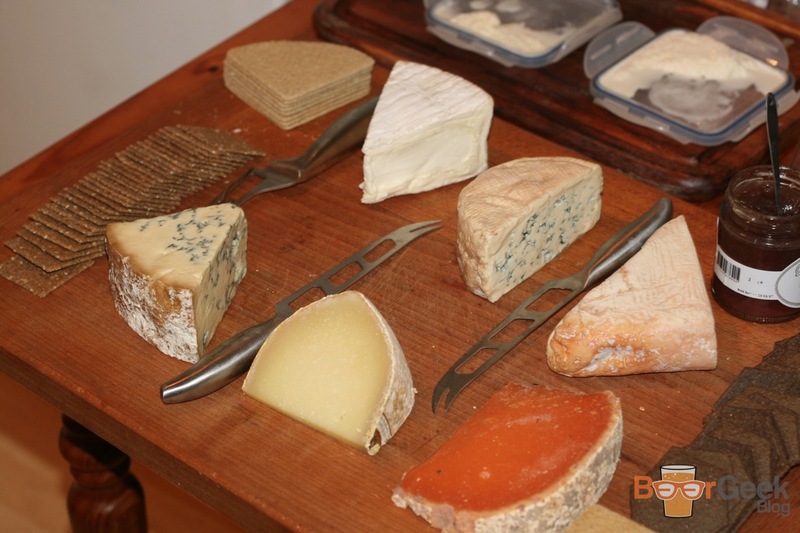 Six exquisite cheeses with four carefully chosen beers. The well balanced board consisted of two of my favourite soft cheeses. ‘Délice de Bourgogne’, a luscious triple-cream cheese and ‘Taleggio’, an Italian cave aged cheese with a distinctive fruity tang. Followed by two hard cheeses. ‘Berkswell’, an unpasteurised sheep’s milk cheese. And bright orange ‘Mimolette’, which is matured in damp cellars where it’s munched on by cheese mites. And finally two blues. ‘Fourme d’Ambre’, which is well rounded, slightly sweet and quite delicate for a blue cheese and award winning ‘Colston Bassett’, my favourite Stilton. Saison’s are a versatile beer for pairing and particularly suited to cheese. 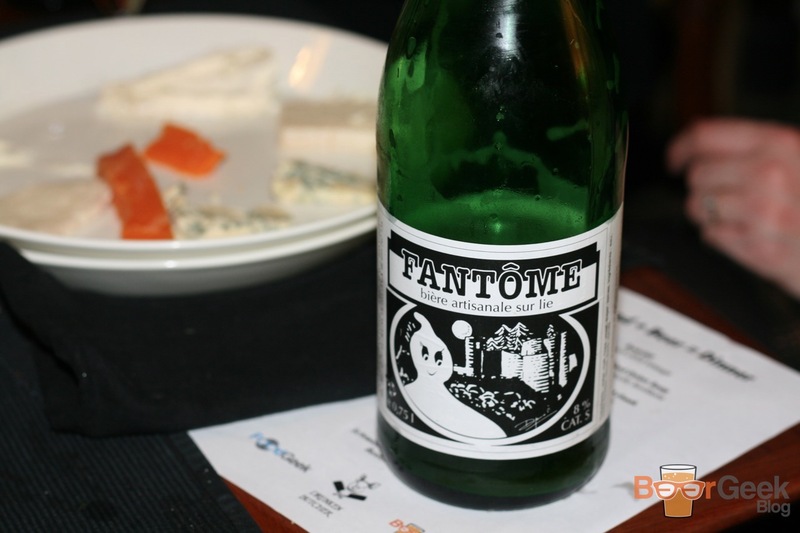 ‘Fantome – Saison’ is one of the best around. Its clean yet funky farmyard flavours are brilliant with the Délice de Bourgogne and Taleggio. The hard cheeses were paired with two German beers. 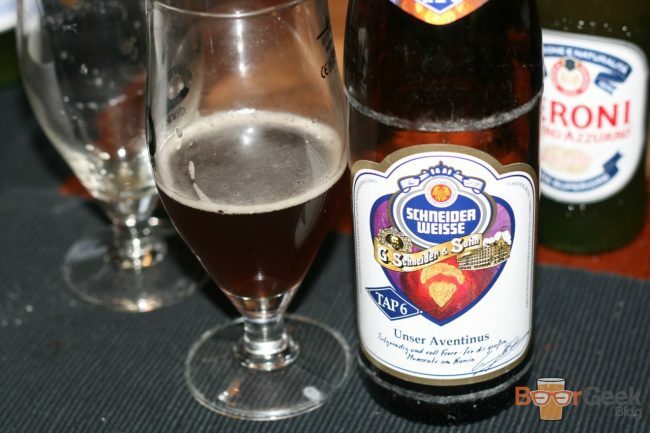 ‘Löwenbräu – Triumphator’, a malty, spicy Dopplebock and ‘Schneider Weisse – Aventinus (Tap 6)’, one of the best Weizenbock’s in the world. The spicy, nutty flavours are similar to those found in the hard cheeses, particularly the Mimolette, so were a natural fit. 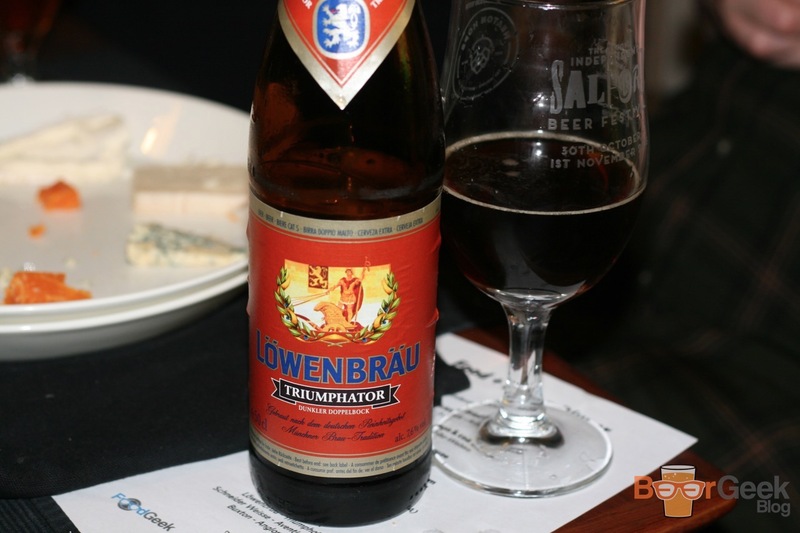 My all time favourite food and beer pairing is blue cheese and barley wine. The richness, complexity and strength they share plays off against each other wonderfully. 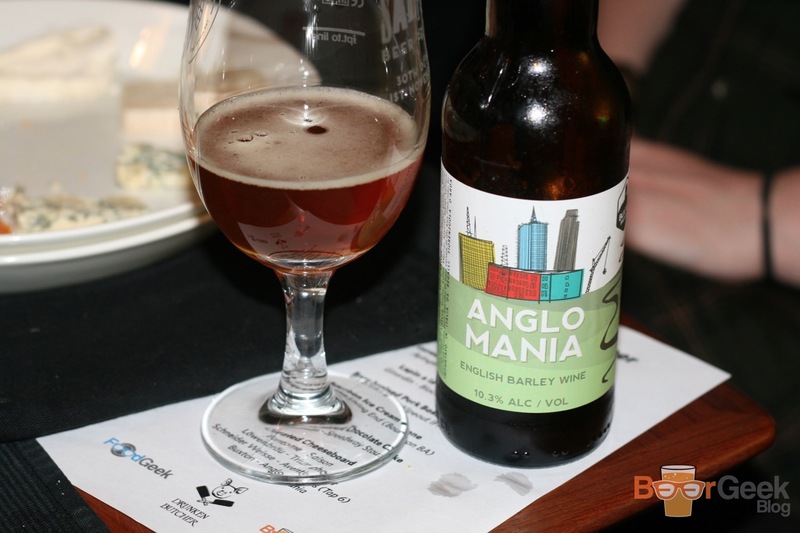 Buxton’s ‘Anglo Mania’ is a stunning beer and paired with a strong stilton it’s a thing of beauty. I couldn’t have been more pleased with the entire night. Iain’s food was exceptional, as ever, and I was happy with all the beer pairings. It goes without saying that Iain deserves huge credit and appreciation. Firstly, for putting up with my constantly changing menu demands and then for actually pulling it off. Particularly the rabbit dish that he’d never cooked before. There were lots of other people who helped make the night such a great success too. All the guests, of course. For coming and for being great company, you know who you are! My good friend Ian who helped choose and source some of the cheeses. The guys at DUB (Drink Up Brewing) in Bolton, Damian at Heaton Hops and Bailey of Grub fame who all donated glasses for the event. Iain’s lovely wife Heli, who washed said glasses about 100 times. And the one and only Mrs Beer Geek. Who despite being there as a guest spent most of the evening pouring and serving the beers.